Ladbrokes Tip: The Blazer Stakes – Myer Classic is a popular spring betting double. The Blazer Stakes, formerly known as the Rose Of Kingston Stakes, is a Group 2 race run at Flemington Racecourse on Turnbull Stakes Day in early October during the Melbourne Spring Racing Carnival. Previously Turnbull Stakes Day was held on the first Sunday of October to avoid a clash with the AFL Grand Final, but in 2017 returned to the following Saturday, and racing on the day is headlined by the Group 1 Turnbull Stakes (2000m). Three Group 2 races also take place at the meeting with the Gilgai Stakes and Edward Manifold Stakes accompanying the Blazer Stakes as the major Turnbull Stakes Day support acts. Open to mares aged four-years-old and over, the set weights plus penalties Blazer Stakes offers $200,000 in prize money and is a key lead-up into the Group 1 Myer Classic (1600m) at Flemington on Victoria Derby Day during the Melbourne Cup Carnival. The latest edition of the Blazer Stakes ran on Saturday October 6, 2018. The Blazer Stakes odds are traditionally led by mares with proven Melbourne form at Caulfield with winning ability over 1400m – 1600m and a good lead-up run in an earlier race for fillies and mares in the Spring. Upsets are not uncommon and looking for value further down the Blazer Stakes betting markets can prove profitable. Recent double-figure champions include Now Or Later ($10 in 2017), La Passe ($31 in 2015), Forever Loved ($13 in 2014) and Fire Up Fifi ($26 in 2013). The spring’s top Blazer Stakes 2018 odds and links to our Flemington Group 2 betting markets on the mares’ only feature on Turnbull Stakes Day will be provided here so stay tuned to back your tips at the best price. The Blazer Stakes field attracts a line-up of the season’s best middle-distance fillies and mares, many heading towards a run in the Myer Classic four weeks later at Flemington Racecourse. Mosheen (2012) is one of the most notable recent Blazer Stakes winners. Photo Credit: Race Horse Photos Australia. A possible lead-up for female gallopers into the field is the Group 3 How Now Stakes (1200m) at Caulfield in late September, which last produced a winner with Now Or Later (6th in 2017). In between the this event and the Myer Classic runners may contest the Group 2 Tristarc Stakes (1400m) on Caulfield Cup Day and the Blazer Stakes – Tristarc Stakes double was last achieved by La Passe (2015). While the Blazer Stakes – Myer Classic double hasn’t been achieved since Sedately (1994), a number of Group 1 placegetters in the latter came off a run in the Group 2. 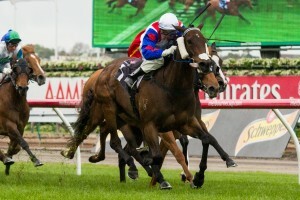 In 2013 Blazer Stakes winner Fire Up Fifi ran third in the Myer classic behind Red Tracer two starts later. That year’s third placegetter Catkins also finished second in the Group 1 two runs later with a Group 3 Moonee Valley win on Cox Plate Day in between. The Blazer Stakes nominations are taken the Monday before the race runs on the Sunday followed by the final field and barriers on the Wednesday. The official Blazer Stakes 2018 Final Field & Barriers are out on the Wednesday before race day and will be published in full below so stay tuned to see what mares make the starting line-up in the Myer Classic lead-up. The official Blazer Stakes 2018 Nominations close on the Monday of race week and will be available right here once announced. The 2017 Blazer Stakes Nominations drew a bumper 24 mares including last start Let’s Elope Stakes winner Sword Of Light chasing the double and the consistent Merriest coming off back-to-back fourths including in the How Now Stakes. Good Blazer Stakes tips include looking for last-start winners who have a good recent strike-rate in the Group 2 and runners further down the markets with the favourites having a poor record over the past decade. Keeping an eye on the lead-up form of mares in traditional preparatory races like the Let’s Elope Stakes and How Now Stakes is also a good Blazer Stakes betting tip. Our Ladbrokes’ insider Blazer Stakes 2018 betting tips and Flemington exotic selections will be detailed below the week of the race so you know what mares to back and sack in the Group 2 this season. The form guide for the Blazer Stakes features all the crucial info punters need to know before placing a bet on the clash including the barriers, jockeys, trainers and lead-up runs of all the horses in the field. The Blazer Stakes form has held-up in tougher races many times in recent years including in 2013 when Fire Up Fifi ran third in the Myer Classic as well as that year’s Group 1 Railway Stakes (1600m) in Perth. Blazer Stakes results have been dominated by upsets in recent years with the last single-figure winner to salute being Mosheen ($4.20 in 2012). Notable recent winners of this Group 2 include Lady Lynette (2011), Divine Madonna (2006) and Sky Cuddle (2005). The official Blazer Stakes 2018 Results & Finishing Order will be available below once the race takes place on Saturday October 6, 2018.